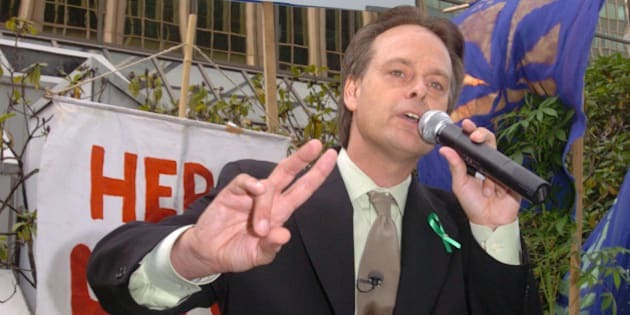 Marc Emery, the so-called Prince of Pot, is due to be released from a U.S. prison this week. Many of his supporters criticized the American prosecution of the high-profile, Vancouver-based activist that began in 2005. In the years since, marijuana has been legalized in several U.S. states, and the issue has become a major platform in Canadian politics. U.S. officials characterized Emery as a "drug dealer" because he sold marijuana seeds to American customers via mail order. He used the profits from his business to support activist groups, lobbyists, court cases and ballot initiatives. Emery has always claimed politics, and not justice, were behind his prosecution. In 2009, he was extradited to the U.S. where he pleaded guilty to one count of conspiracy to manufacture marijuana. Emery was sentenced to five years in prison. At the time, American drug enforcement officials boasted of his arrest as a "significant blow" to marijuana trafficking and to the legalization movement. In contrast, Washington state on Monday issued the first licences for stores to legally sell recreational marijuana. When will he be freed? Emery, 56, is scheduled to be released from the low-security, federal correctional institution in Yazoo City, Miss. on July 9. In 2013, his wife and fellow activist, Jodie Emery, unsuccessfully lobbied the federal government to allow Marc to serve the rest of his sentence in Canada. When will he be back in Canada? Despite being freed on July 9, it could be weeks, or even months, before Emery is back on Canadian soil. He will first stop at an immigration facility in Louisiana where he must wait for a temporary passport to be issued, and a plane ticket to be purchased by U.S. officials. After that, he's expected to fly to Detroit/Windsor and then make his way home to Vancouver. Emery is guessing he'll be back in mid-August. Can anything be done to speed up his release? Emery is asking supporters to provide "motivation" for the Canadian government to repatriate him on a "more reasonable and timely schedule." I am certain that perfidious actors in Ottawa could choose to be deliberately slow, lazy or obstructive, simply because it's me, and the Harper government is hardly eager to have me back in Canada. That is where my many supporters can influence events, should this procedure get unduly tardy; I may need all of you to call one of those three locations, or all three locations, for several hours a day, urging an end to any questionable delays if they should happen. But we will see. Just be ready to help if you are so inclined! What are his plans after his release? Emery plans to aggressively lobby to unseat the "prohibitionist" Conservative government. Starting in September 2015, Emery plans to hold rallies in 30 Canadian cities leading up to the October federal election. Meanwhile, Jodie Emery announced she plans to seek the federal Liberal nomination in Vancouver-East. In his final blog post from prison, Emery wrote that he expects to "marvel at all the changes in Vancouver," including hundreds of new buildings and 35 medical marijuana dispensaries that have opened.